Elbow as a band was already founded in 1991, under a different name (they changed it in 1997), but their debut and excellent album "Asleep in the Back" was only issued in 2001. Following that release, the band was immediately filed in the bandwagon already crowded with Radiohead, Coldplay, Doves and even Muse. Sure Elbow shares with these bands a similar knack for orchestrated but melancholic/heroic songs full of pathos, near prog-rock arrangement and larger-than-life vocals. As a matter of fact, from the first album on Elbow's music is maybe the most 'symphonic' of the whole bunch while being also the least rockish in general, even if they can be pretty hard rocking when they feel like it. Elbow is relying more on keyboards and vocal harmonies as well. But contrary to Radiohead's artistic pretentions, Coldplay's obvious super stardom ambitions, Muse's virtuosic dinosaur rock performances and even Doves' melodramas, Elbow has near always kept a rather low profile attitude, very human and humble while being among the most productive on records. Despite raving reviews and endorsements by major (in popularity) artists like R.E.M., Radiohead, U2 and even the very picky John Cale, Elbow had to wait until their fourth album "The Seldom Seen Kid" (2008) to enjoy some commercial success, and obviously drowning under several awards, among other the 2008 Mercury Music Prize. Because of this, a larger audience missed one major masterpiece of the last decade with "Cast of Thousands", their second album released in 2003, which contains pearls like "Switching Off" or the well titled "Crawling with Idiot", among others. On my side, I always thought their lack of success found its source in their bandname. Philip Marlowe's character, so Raymond Chandler, could say that the word "elbow" is the most sensuous word in the English language; not for its definition, but for how it feels to say it, it's nevertheless one of the lamest name one could think of for a band. Furthermore, when you take a look on the album cover of their debut (1), one would expect the music to be rather hardcorish if not nu-metal and one would be very surprised, like I was, to hear such orchestrated and arranged melodic rock with one of the most gentleman-like vocals ever heard through frontman Guy Garvey. Guy Garvey's voice, slightly reminding Peter Gabriel's Genesis area, an influence which he totally endorses, is one of Elbow's strongest asset. An extremely soulfull, articulate and welcoming singer, there's something more of a crooner than that of a rock singer. Guy Garvey appears on the Massive Attack record "Heligoland", released in 2010, and he's even duetting with Tom barman on the last album "Vantage Point" (2008) by Belgian band dEUS. Another strong point in Elbow's music are their rare sense of dynamics which they learned from Talk Talk. And it is one proof of that band's, and Guy Garvey's, humility that they don't create a blur around any comparison suggested to them. Concerning Radiohead, Garvey even declared "There would be no Elbow without Radiohead." (2) This little declaration can raise some interpretation knowing that Elbow finally got a record deal after Radiohead's huge commercial success at the end of the 90s, but Garvey anyway showed enough its admiration for the band from Oxford. No matter what, Elbow is a very different animal. On many aspects, Elbow is a traditional band, they go into a recording studio with their instruments, they are surely using what's left in the studio if needed, but they nearly never resort to electronic sound processing and fashionable gimmicks. Besides, Elbow never felt the need to invite some famous producer, their last three albums were recorded by themselves in some local Manchester studio. Elbow is clearly in the style of working class heroes, a bunch of hardworking chaps building their career little by little, patiently, meticulously, and by doing so they've already create a very solid body of works through their five albums to date. In an era of quick ascent to fame and an even quicker descent to being a has-been, Elbow's progression is almost refreshing. In the same way, there is no radical change from one album to the other while succeeding in giving each of them a very different flavour. Their music is varied enough to sustain interests throughout all their albums, from the most rockish "Leaders of the Free World" in 2005 to their most arranged and experimental "The Seldom Seen Kid" in 2008. "Build a Rocket Boys!" takes Elbow back to their first two albums while completely avoiding to parody themselves. This last album is also their most sober and nostalgic one. Knowing Elbow, the word 'sober' should be taken with precaution for a band using more choir than backing vocals, lush string arrangement and songs evolving regularly over the five minutes mark to even eight minutes on the opening track "The Birds". Except for "Leaders of the Free World", Elbow always open their albums with one of the longest songs in the tracklist, this last one is no exception. Lyrically, Guy Garvey was very much inspired by his life as a young 20 year old lad hanging out in Manchester surroundings (3), falling in love, not knowing what to do with his life, classic stuff. That inspiration is also felt in the music which like the lyrics is melancholic and reflective. 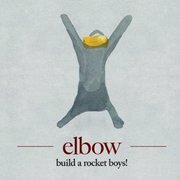 Elbow was already no rock band in the strictest term, there is maybe one really busy energetic track on the whole album with the single "Neat Little Rows" and its heavy guitar riffs and stomping drums quite Radiohead like intro and further guitar progression accompanied by an insisting bass drum pulse going all through the song till the end. This track stops at 5:40 min but it could have stopped at 4 min in my opinion, that overlong and repetitive coda adding nothing much to it. That's one complain I've got concerning this album, for the first time I feel like Elbow's songs are often too long. One of Elbow's trademark is the absence of solos, they always succeeded to make it completely unnecessary thanks to ever evolving and involving variations of the main melodies during the song bridges or as a song final. They did a great job again on the extra long "The Birds", one of the best track on the album, but this time I could almost miss a little solo or something to relaunch the interest on some other tracks. Unfortunately, the shortest tracks like "Jesus Is a Rochdale Girl" and "The River" isn't much grist to the mill, these songs sound pretty uninspired musically, and it's only thanks to Guy Garvey always great performances that it remains compelling enough not to get simply boring. The lack of inspiration is perceptible throughout the whole album, with some fine moments here and there. The intro to the closing song "Dear Friends" sounds alarmingly like some earlier Coldplay, which is ironic knowing that the later near ripped off one Elbow's song ("Grace Under Pressure") on their own "Fix You", or maybe it's some waving back at them. And for the first time, there's really, and in my opinion, a complete misstep in the whole Elbow's songbook with "Open Arms" and the very silly anthem of a refrain "we got open arms for broken hearts" sung with the delicacy of the Manchester United hooligan firm the Red Army on some horrendous military marching drums. Fortunately, this album also contains at least one pearl of a song with the second track "Lippy Kids" with its one note stomping piano intro which lost itself into further little variations on the keys while Garvey goes whistling like some lonesome cowboy in the wind, then the song evolves more orchestrated further and further with clouds of choir into a very affecting melody and one of Garvey's finest performance. The lyrics contain the refrain and album title "Build a Rocket Boys!" where Garvey is performing a very effective, gripping, and poignant call for kids to believe in their dreams and take their life in their own hands. That song really stands out and goes alongside their best emotional ballads like the mentioned "Switching Off" and on their former album the fantastic "Mirrorball". The band recorded live a little later an even better version of that song, more sober, no choir, less studio effects (anyway) (4). Elbow has near always been Guy Garvey's backing band, or said in other words, it seems that the music composed has always been to support the singer. It has never been so true than on this last album. This is what a Guy Garvey's solo album could sound like, only it's Elbow not Garvey and somewhere it seems like this album got stuck somewhere in the middle between Garvey's inspiration and the band musical appetence.